In Paris in 1895 the Lumière family were regarded as the first to use live music to accompany their films. From the advent of film until ‘talkies’ were invented, approaches towards the use of live music varied wildly from the use of pieces by the canonic ‘masters’ such as Bach and Mozart, to kinobibliothek music and original compositions and improvisation. Although the orchestra was first used to accompany films in theatres as early as 1896, it was not until 1908 that French composer, Camille Saint-Saëns, wrote the first original score to be performed live with film. Over the following two decades many film makers and composers followed suit. Among these composers were such famous names as Darius Milhaud, Arthur Honegger and Dmitri Shostakovich. “Film music was born illegitimately as a literal-practical child of necessity.” This is a very strong assertion by Bazelon, and like any other absolute socio-cultural observation, it paradoxically lacks the details which may make it true. The modern film score has evolved, and will continue to evolve through context, purpose and meaning, like any other art-form has since the dawn of mankind. It is for this reason that even early film music cannot be simply dismissed as a cog in the machine of cinema, but the wider socio-historical context must be taken into consideration. Firstly, the influences of previous associations between drama and music must be taken into account. These span back as far as ancient Grecian drama, but most notable in recent times is the influence of Wagner and his gesamtkunstwerk. This shaped the setting for early cinema. It is also of consequence to note that the birth of cinema was not merely the work of one person in one place at one time, which then spread from a pre-ordained format. It had several births across the globe at more or less the same time, but the contexts in which these births happened had strong cultural influence over how cinema developed. This also effected how music was used throughout, and the various approaches that were taken to arrangement, improvisation and composition. At first there was little structure to the art of musical accompaniment to film. Keyboard performers would arrange and improvise on popular or classical pieces, but this gradually grew into an artform. The incorporation of the was pivotal to this process, as was the involvement of many postromantic composers. One of the most notable publications of the era was Sam Fox Moving Picture Music by J. S. Zamecnik. This book was the first publication to attempt to generate new music for film based on mood and other aspects of cinematic motivation. Section 2 will discuss the concept of gesamtkunstwerk as devised by Richard Wagner. It will also consider the influences of previous collaborations between art-forms. Section 3 will discuss the historical context of the development of cinema with reference to the various auteres and some of their more seminal works. Section 4 will examine the different approaches that were taken towards the arrangement of music for early cinema. Section 5 will discuss the ‘music library’ approach to cinematic scoring. This section will focus on Sam Fox Moving Picture Music (1913)by the American-born Czech immigrant composer, John Stepan Zamecnik. The term kinobibliothek (1919) (or kinothek) was later coined by the composer Giuseppe Becce for his work. Section 7 concludes. The concept of a total artwork, a gesamtkunstwerk, was invented by the German composer Richard Wagner. A gesamtkunstwerk was intended to be a new art form, which could include all known forms of creative expression. It was Wagner’s belief that “[t]he highest conjoint work of art is the drama [and that] it can only be at hand in all its possible fullness, when in it each separate branch of art is at hand in its own utmost fullness.” However, the idea of combining temporal artforms in order to develop new forms of expression, was not a wholly original one. As far back as ancient Greece saw the use of music as part of dramatic performances. “A flute-player accompanied the classical Greek tragedy and comedy … The music he played was essentially simple and completely subordinate to the speaking of the poetry.” The operas and ballets of the 18th and 19th centuries were also a combination of drama, music and dance (in the case of ballet). In many ways, Wagner merely put a name to what was already in partial existence, but many of his theatrical developments became foundations for the cinematic experience. Among these were the darkening of the auditorium, widening of the gap between audience and stage, requesting that the audience not applaud during the performance and the classless (or continental) seating design. Many modern artworks will now frequently include aspects of different artforms, but these will often come to be through collaboration between proponents of various artistic genres. Wagner’s idea was that a gesamtkunstwerk should have one creator and controller for “artistic unity … the all-powerful director or regisseur”, more commonly referred to as the auteur. This definition of a director strongly influenced the structure of modern film. Wagner’s music and instrumentation were also hugely influential to the development of cinema. The concept of a leitmotif, a theme representing individual characters in a story, is a compositional method which was not inherited initially into film scoring, but it is still going strong today in mainstream cinema. A recent example of this approach can be seen in Howard Shore’s scoring of The Lord of the Rings trilogy. In this piece, he uses many different themes to represent people, places and objects. He also often goes one step further and associates characters with individual instruments. In The Fellowship Theme, as the fellowship part their ways the instrumental parts are omitted from the theme, as they too part their ways. The leitmotif is a simple but effective approach, which has been employed by many other modern film composers. Wagner’s use of “symphonic orchestra [and his] … prevalent postromantic musical style” are also dominant features in the structure of the ‘classical’ film score. In addition, many of his compositions were ‘borrowed’ directly for different films during the 20th century. Some examples of these are; The Ride of the Valkyrie used by D. W. Griffiths in The Birth of a Nation (1915), The Prelude to Das Rheingold in Nosferatu: Phantom of the Night (1976), Tristan und Isolde in Romeo and Juliet (1996). These are but a few examples from a very extensive list. The advent of cinema was not simply one seminal moment, but a series of sometimes related and sometimes unrelated developments or events. There were several different inventions which paved the way for the modern cinema. 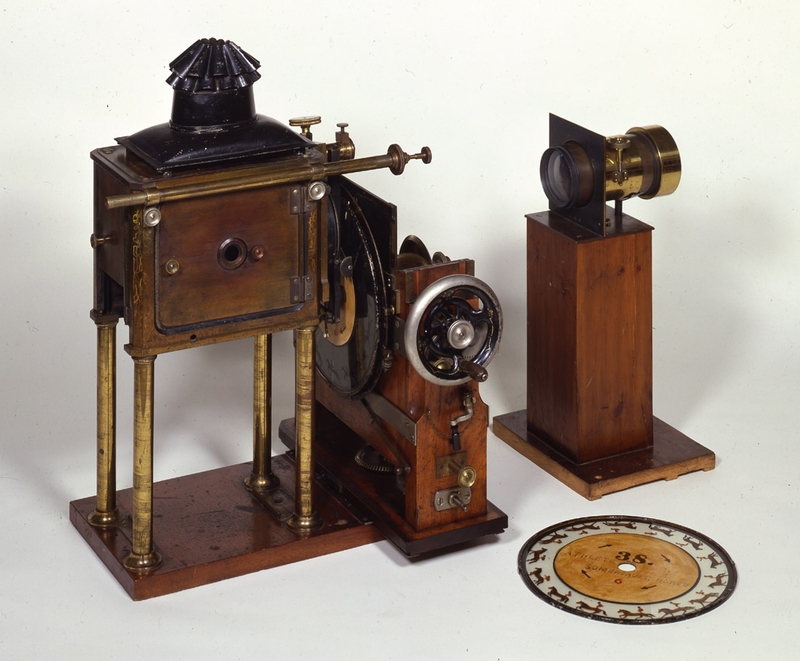 Some examples of the early experiments with moving image can be seen in such devices as the Thaumatrope, Phenakistoscope, Zoetrope and Praxinoscope. The American, Eadward Muybridge, was a photographic pioneer who was obsessed with capturing motion, and in 1879 he invented the Zoopraxiscope (fig. 1) which combined photography and movement for the first time. Essentially it was a development on the Zoetrope and Praxinoscope, which projected images from rotating glass disks in rapid succession to create the impression of motion. The great inventor and entrepreneur, “[Thomas] Edison wanted to capitalize on Muybridge’s expertise and reputation in the field of motion pictures and suggested a cooperative venture.” For what was probably rather unfortunate for Muybridge, he declined on the grounds that he thought that trying to combine moving pictures and sound would be too difficult. Edison went on to invent the Kinetoscope and Kinetophone. The former was his own designed device for viewing moving pictures. It took him three years to design and when it was finished it had a peephole viewer, which only allowed one person at a time to view moving pictures without sound. The latter, however, was merely the former with an added phonograph. Despite the rather limited capabilities of the machines, a Kinetoscope parlor was opened in New York in 1894. Many others followed in succession across the country. During this period while Edison was concerning himself with the combination of moving pictures and recorded sound, he was surpassed by his French cousins. “When the Lumière brothers, Auguste and Louis, demonstrated their Cinematographé (an improvement over Edison’s devices) in Paris in 1895, a piano was used to both cover the noise of the projector and support the mood of the films.” This statement maybe closer to the truth than Bazelon’s assertion that music was performed for purely mechanical reasons. Although the Lumière brothers are widely regarded as the founders of modern cinema, it is a little recognised fact that they themselves were preceded in the invention of the modern cinema by a German inventor called Max Skladanowsky. “[T]he Wintergarten performances [in Berlin] were the first projections of film in Europe to a paying audience. Rear projection was used, with stagehands keeping the screen wet to increase its transparency, and original scores were composed for the nine films by Hermann Kruger.” Although this method was extremely developed for its time; the use of a hidden projection system and an original score, the films were each only around 6 seconds long. It was mainly for this reason that his work was overshadowed by that of the Lumières. So it was not the case, as described by Prendergast, that “[t]he first known use of music with the cinema was on December 28, 1895 … at the Grand Café on the Boulevard des Capucines in Paris.” It was instead on November 1, 1895, in Martin Luther Strasse in Berlin and it can be attributed to Max Skladanowsky. It might be argued that Skladanowsky’s films did not contain the same level of narrative engagement as La Sortie des usines Lumière, but this is definitely a debatable issue, as there is also very little narrative to be deduced from a single shot of workers leaving a factory. This argument extends more from a literary and aesthetic perspective, as opposed to a simple observation of the arrival of the mechanism of cinema. However, in both of these examples we can see how music was an integral part of the initial concept of the modern cinema, and it would be fair to regard Kruger’s compositions for Skladanowsky as being the first original film scores. Back across the water, Edison bounced back onto his feet and unveiled his own projection system in 1896, called the Vitascope (fig. 2). This was launched with orchestra playing live support to the films. As many performances happened in vaudeville theatres, it was often the case that these orchestras would be the ones to accompany the films. In many ways these first few films were simply an extension of photographic principles and they were indeed just motion pictures. However, “[w]ithin a short time, these one-shot films were superseded by multi-shot films, with the consequent development of editing and the evolution of key genres … By the end of the first decade of ‘cinema’, its commercial institutional patterns were also becoming more clearly identifiable.” One of the most famous European early narrative films is A Trip to the Moon (1902) by the French magician Georges Méliès. Edwin Porter, a projectionist at Edison’s studio is regarded as producing the first American narrative film, The Great Train Robbery (1903). “Music for the movies not only heightened the emotional response to the pictures, but also served the practical purpose of drowning out the whirr of the projector. … “It was the aim of the exhibitor to eradicate the silence from silent pictures.”” There were many different approaches to the arrangement and composition of music to accompany silent film, and in many cases, especially in the early days, it was left to the discretion of the exhibitor. There is no clear progression between these approaches, and they often co-existed alongside one another, but they can be roughly categorised as; keyboard improvisation (often with sound effects), pre-arranged musical extracts performed by a keyboard player, chamber ensemble, or orchestra, continuous score of pre-arranged musical extracts usually performed by orchestra, and continuous original score performed by an orchestra. 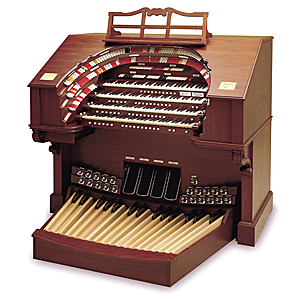 Keyboard accompaniment was used for the first cinematic screenings in France and England. This was nearly immediately replaced by Orchestra where possible, but most modest film houses would have to make do with the keyboard player. The keyboard player had one of the toughest jobs. They were arranger, composer and performer. In most cases they were not paid very well, they had to work very long hours (often films would run back to back for a full day while the audiences came in and out), and they were rarely given any credit for the hard work that they did. “For the most part, the music consisted of original extemporizations or variations on familiar classical and popular tunes [and i]n cinemas equipped with theater organs [(fig. 3)], sound effects (whistles, bells, sirens, etc.) were often integrated into the improvisations.” Many of these pianists would have repertoire pieces and personal collections, which they would arrange themselves and improvise around. However, the first publication of this kind was Sam Fox Moving Picture Music, Vol. I (1913) by J. S. Zamecnik, which will be discussed in section 5. This first volume contained 25 pieces with generic descriptive titles, such as; Festival Music, Death Scene, Hurry Music and Sailor Music. This approach to musical accompaniment was the most cost effective by far, and many film studios chose to issue cue sheets to be presented to the orchestra directors of the ‘Picture Parlors’. Music directors or ‘Fitters’ would work alongside the film directors to decide which pieces of music to use and where, or in some cases to arrange pieces and send out scores with the films. Some directors, such as D. W. Griffiths, considered the place of music so sacrosanct in film that they would even used ensembles and orchestras on set to inspire the actors performances. For his film The Birth of a Nation (1915), Griffiths worked closely with his ‘fitter’, Joseph Carl Briel, to create a score which was a combination of arranged extracts and original compositions. However, for commercial reasons ‘library music’ compilations such as those published by Sam Fox Publishing Co. were dominant in USA for much time, but this was not the case elsewhere. 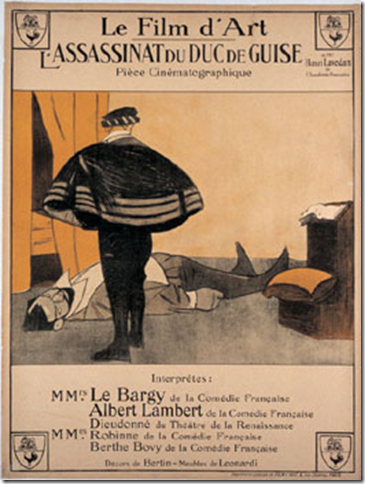 “When Films d’Art … wished to demonstrate the artistic merits of cinema, it not only induced members of the Comédie Française to act L’Assassinat du Duc de Guise (1908)[(fig. 4)], but commissioned Camille Saint-Saëns to compose an appropriate orchestral score.” This is regarded as being the first ever full length original film score, which was later published as Saint-Saëns’ Opus 128. Other directors and composers soon followed suit. Some of the more notable early examples of this kind of collaboration are; The Battleship Potemkin, La Roue, Napoléon, L’Inhumaine and The New Babylon. There is some truth in this statement. Many of these short pieces bare some resemblance to other canonic favourites. Below are two extracts; the first is the famous Funeral March by the 18th century Polish Composer, Fryderyck Chopin (fig. 5), and the second is Zamecnik’s Funeral March (fig. 6). These extracts are clearly not identical to each other, but there are similarities in the feel and style and the rhythm is nearly identical for the main theme. In contrast, Chopin’s piece remains quite dark and mostly homophonic throughout, while Zamecnik’s piece turns more sentimental and melodic after the initial eight bar phrase is repeated. The extract above is another example of Zamecnik’s compositions in Sam Fox Moving Picture Music Volume I. This piece has some slight resemblance to Mendelssohn-Batholdy’s Wedding March, but what is more interesting is how familiar the style of the theme sounds today. The melodic and harmonic rhythm of the first four bars of this piece have been the basis for action/adventure themes in films and television programmes in the late 20th century. The harmony in this case is not particularly complicated; i.e. I, ii7, I, ii7, I, Vb, I, IV, Ib and I, but what is more notable is the uneven harmonic rhythm which could be noted to some of the late romantic composers, such as Claude Debussy, for example. In many ways, the early influence of postromantic composers such as J. S. Zamecnik, Camille Saint-Saëns, Joseph Carl Breil and Edmund Meisel paved the way for film scoring to come. When considering the place and purpose of music in film, it is important to approach the subject from many different angles. The era of the silent film was a mere thirty years, but by analysing that period it might be possible to learn more about the how and why of the relationship between music and film today. There are many people who helped shape the modern cinema and many of them have been forgotten or not recognised for their contribution, and in some cases never will be. Further research might consider the works of Max Skladanowsky and Hermann Kruger and their place in the history of early cinema. Other work could analyse the differences between audience reception of silent film in Europe and USA. Research could also include analytical comparison between the various forms of ‘library music’ and consider the technical progression of early film scoring. Posted on May 20, 2012, in Academic and tagged academic, auteur, bazelon, chopin, edison, festival march, film score, films d'art, funeral march, gesamtkunstwerk, j. s. zamecnik, kinobibliothek, kinothek, kruger, leitmotif, lumière, marc balbirnie, mmt, mphil, original, sam fox moving picture music, silent film, skladanowsky, talkies, the jazz singer, the lord of the rings, theatre organ, trinity college dublin, vitascope, wagner, zoopraxiscope. Bookmark the permalink. 3 Comments. Hello Marcness my old friend.